Team Yellow got off to the better start by leading 20-16 at quarter time thanks to good contributions by Luke Willter and R’Raem Termeteet. Team Blue came back in the second quarter to lead at the long break by 1 point (35-34). The girls in both teams were contributing in both offence and defence and did not yield to the larger physical presence of the male counterparts. The third quarter belonged to Team Blue and they looked as if they would run away with the game. In the final quarter a change in defence by Team Yellow to a triangle and 2 and the change in offence to lobbing the ball into their big man in Ngetimis Emesiochel provided a swing back in their favour. Through the last few minutes the lead swung back and forwards by a single point. With 33 seconds left the Blue Team got a lead of 3 points, but to Team Yellow’s credit they set up their offence looking to score and draw a foul. 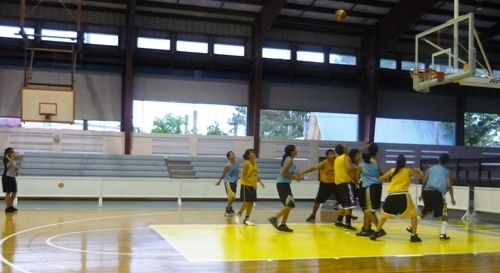 The score came with 2.3 seconds remaining, but the foul did not and so the game ended with Blue 67 and Yellow 66. Highlights of the game included a magnificent block by 5’8” Nicole Gabriel (just 13 years of age) and the aggressive defence of 5’ Mariah Joseph who attacked every male player with no fear of physical pain. While the boys dominated on the score sheet, Team Yellow players Diliaur Kumaichi with 9 and Nicole Gabriel with 5 showed that they will be a scoring threat in the future. In the International Tournament for Men the game resulted in a forfeit by the FBL All Stars to the BMP All Stars. This has resulted in the FBL Team being removed from the competition. 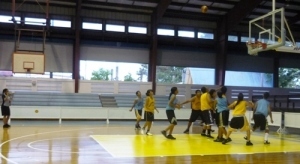 The Games continue through to Saturday when it is likely that Youth Blue will meet the National Women’s team in the final of the Super league and Team Palau will come up against the BMP All Stars in the International Tournament final game.